Be the first to share your favorite memory, photo or story of Novella . This memorial page is dedicated for family, friends and future generations to celebrate the life of their loved one. 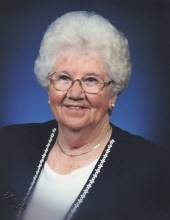 Novella Joy Steele was born January 5, 1929 in Laurel County and departed this life Sunday, April 7, 2019 at her residence, being 90 years of age. She was the daughter of the late Pascal & Mae (Tackett) Gentry. Novella is survived by her son, James Steele and his wife Carmiletta; by her granddaughter, Tracie Steele Van Winkle and by her great grandson, Ethan Van Winkle. She is also survived by three sisters, Doris Parker of Richmond, Thelma Hellard and her husband Henry of Richmond and Velma Cates and her husband Noel of Hooven, OH. In addition to her parents, Novella was also preceded in death by her husband, James W. Steele; by her daughter, Brenda Kay Isaacs; by three sisters and two brothers. Novella was a member of the Sand Gap Christian Church. "Email Address" would like to share the life celebration of Novella Joy Steele. Click on the "link" to go to share a favorite memory or leave a condolence message for the family.